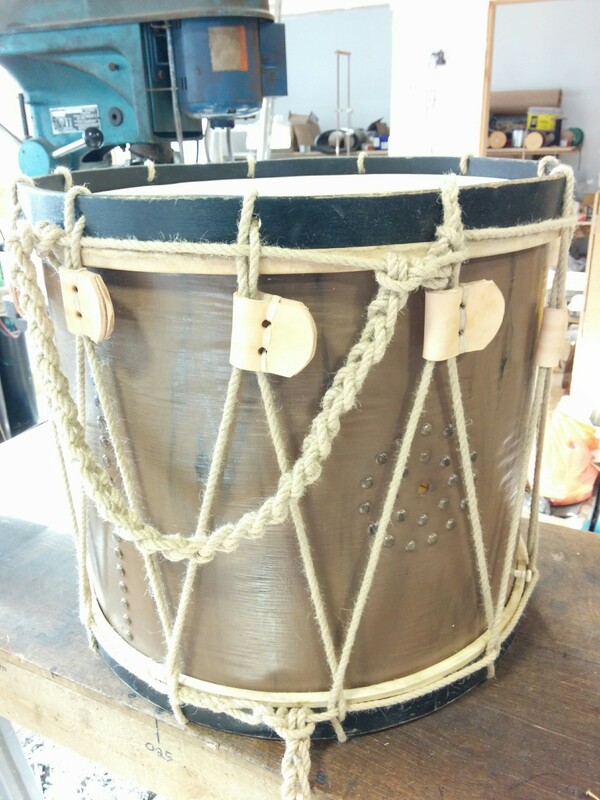 In the previous part of this post – 1249: ropey drums (pt2) I was making up new lengths of rope and repairing the buffs, all preparation to do most of the drums. However I was left with three drums that needed new buffs to be made because I have changed the rope to match all the others in two cases or there were several missing in the third case. 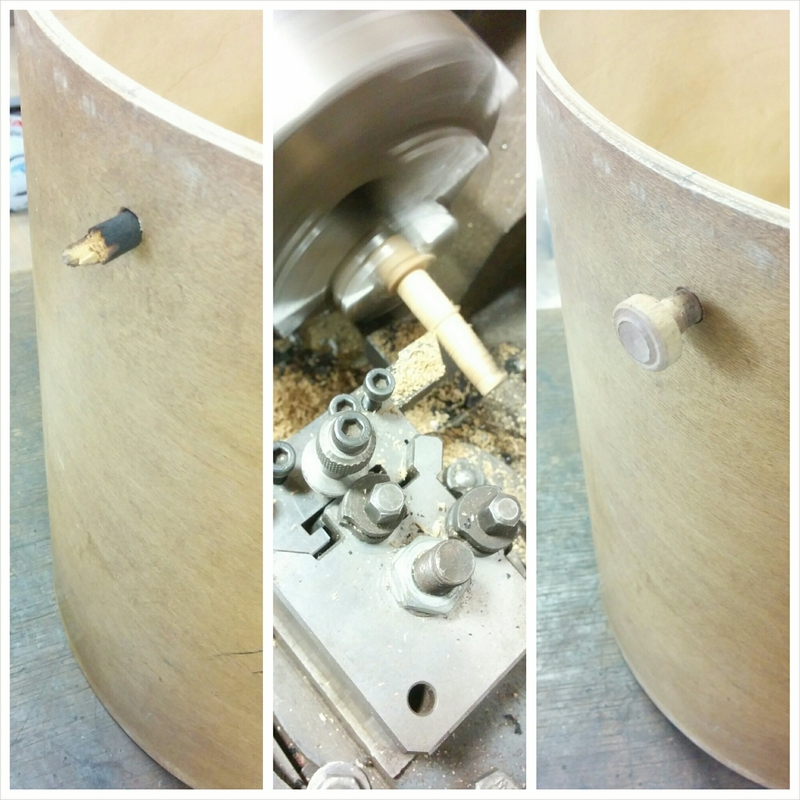 As you would expect, there were also repairs to be made, whilst the drums were in pieces in my workshop. 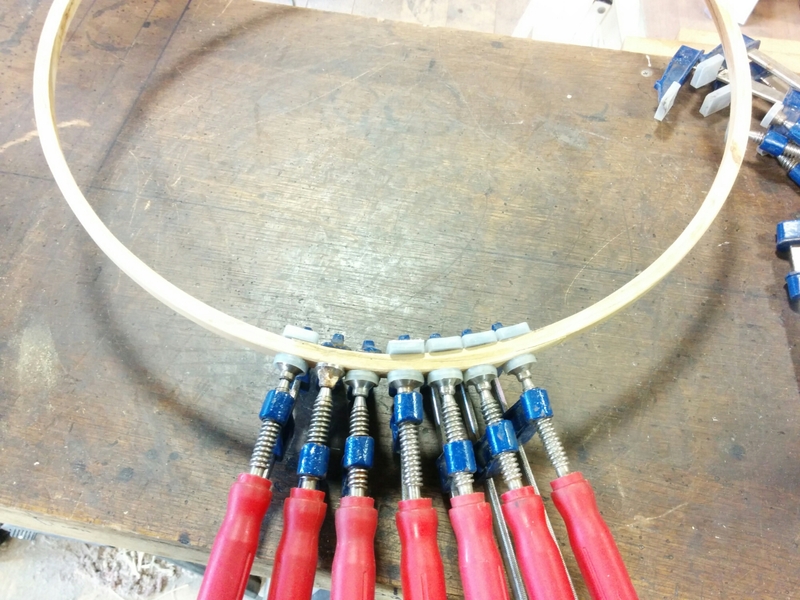 Flesh hoops had to be made the correct size for the heads to be lapped onto. 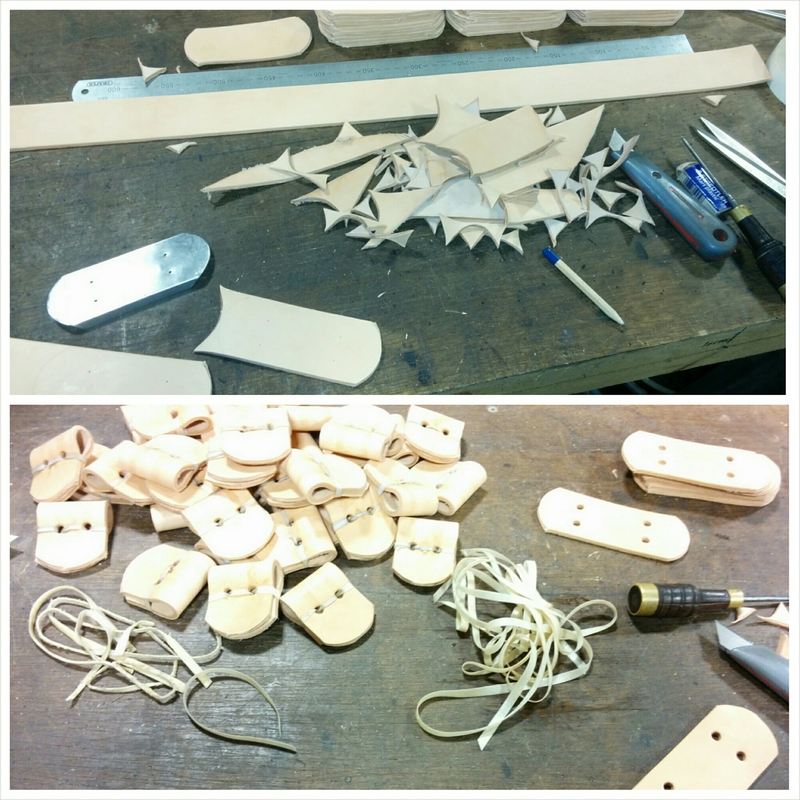 But finally, having everything needed and repairs and parts made, I am ready to put new heads on the drums. The first thing I do is to spray the heads with water to make the skin become soft and pliable. There are a few reasons for doing this, skin (and wood) are hygroscopic which means that they absorb and release moisture. If it is cold and dry, our own skin suffers, if we stay in the bath too long it becomes baggy soft and wrinkly. Therefore we utilise this property to our own advantage. First of all by wetting the playing surface (but leaving the lapping dry), the strain is taken off the flesh hoop allowing it to flatten. 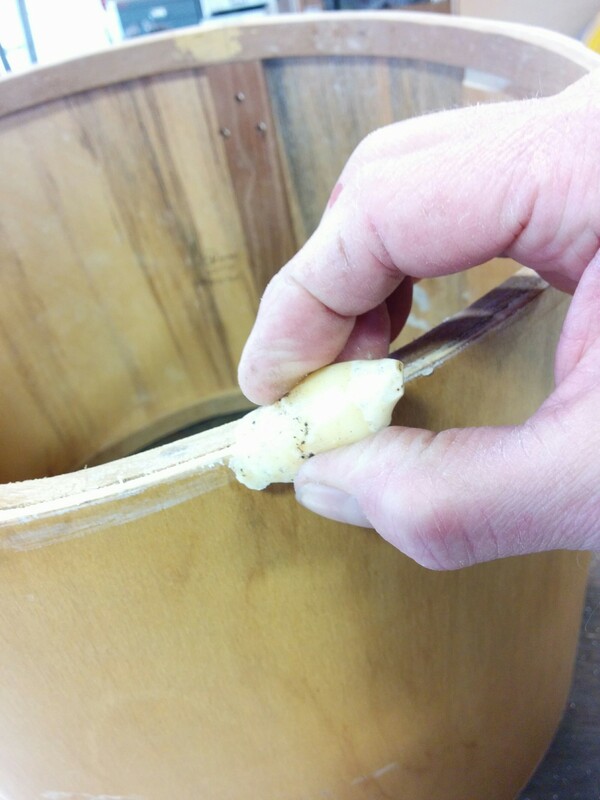 When the head is put on the drum, the skin will mould itself to the profile of the bearing creating a good contact. If this is not done, then the head may buzz in the areas where there is a fraction of a millimeter gap. 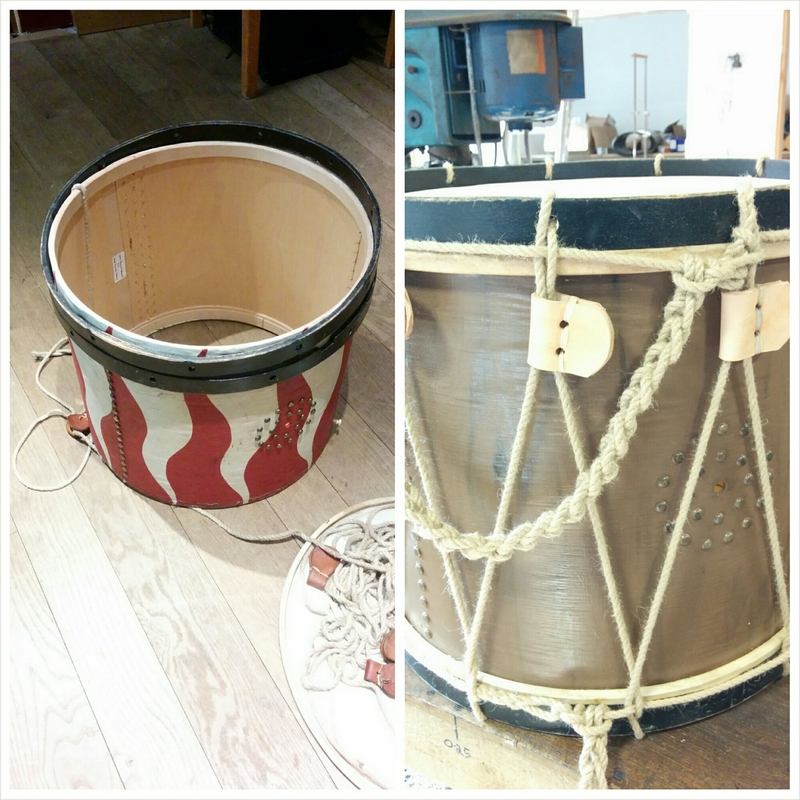 Lastly, it can be easily stretched, so that when I put it on the drum, I can pull the skin down the sides of the drum and create a collar. However, in use, the hygroscopic nature of the skin can be a problem, well judging on what I see coming in for repair, it is a problem. 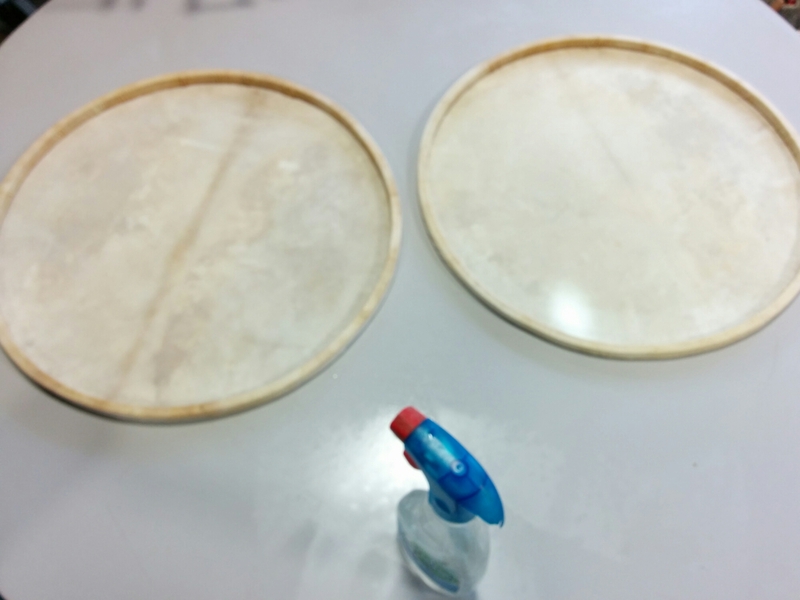 Therefore I have written a post in the Every Percussionist Should Know… series called: …How to look after vellum heads. Whilst the drum heads are softening, I prepare the bearing edge by lightly sanding it so that all the dirt and proud wood fibres are removed. I want a nice smooth surface for the head to slide over when it is being tuned. To further help the head slide, and to prevent it from sticking to the wood (the proteins in skin make exceptionally strong adhesives) I lubricate/seal the surface with tallow. Now it is just a case of threading the long bit of rope through the counter hoops and buffs, and tightening it up. The drum above is the shell that I painted to make it look, “as natural as possible,” as was the remit. It has new rope and the new buffs I made above. To remind yo what it looked like I shall end with a before after picture. I can supply the rope. If you are intending to use the drum as a musical instrument, then be prepared for some serious hard work and blisters if you intend to do it yourself. Email me a photograph, and let me know the counter hoop and the shell dimensions and I will have a better idea of what you need.